A friend of mine has a suicidal daughter and worries about her constantly. The daughter attempted suicide once, and has threatened it many times. “When I wake up in the morning, I wonder if this will be the day she succeeds,” the mother explained. She has nightmares about her daughter and feels totally helpless. If your loved one is suicidal you may have similar feelings. You may be so worried that you are unaware of your anticipatory grief—a feeling of loss before a dreaded event or death occurs. All you know is that life is different, dark, and bleak. Without any warning you may start crying, an upsetting experience. Focusing your thoughts is hard because your mind keeps wandering. Like a leaking faucet, sadness seeps into your days. Rabbi Earl Grollman, in his book, Suicide, notes that suicide attempts may not seem serious. Although family members may dismiss these attempts as attention-getting behavior, Grollman thinks every threat should be taken seriously. “There is no more dramatic and poignant cry for help,” he explains. Grollman goes on to say that people who attempt suicide are depressed, mentally ill, grieving, gay, have debilitating illness, are alcoholics, addicted to drugs, facing life transitions, have Post Traumatic Stress Disorder, or feel abandoned. “There is no single causational factor,” he notes. Unfortunately, many family members feel manipulated by ongoing suicide threats, and you may be one of them. How can you cope with the anticipatory grief of suicide attempts? Here are some suggestions. Call time out. Rebecca Woolis, author of When Someone You Love has a Mental Illness, thinks it’s important for family members to pace themselves and take breaks. “The presence of family and friends can be more harmful to the relationships than it is helpful to the person,” she writes, especially if your loved one abuses drugs and/or alcohol. Keeping a “loving distance” can be helpful, according to Woolis. 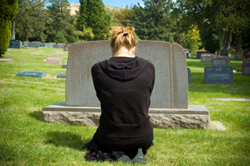 Know the symptoms of anticipatory grief. Dr. Lois Krahn, my co-author. and I list the symptoms in our book, Smiling Through Your Tears: Anticipating Grief. The list includes emotional numbness, nervous/restless behavior, mood swings, forgetfulness, changes in your health, hyperactivity (to escape feelings of sadness), poor sleep, fatigue and exhaustion, and feeling isolated and alone. If you have several of these symptoms it may be time to seek help. Learn how to control negative thinking. When a negative thought comes to mind, try to balance it with a positive one. Dr. Heidi Hosley and Dr. Gloria Horsley, authors of Teen Grief Relief, call this “thought stopping.” Recalling happy experiences may help you do this. “Select a pleasant thought and hold it in your mind as you touch your thumb and index finger together to make a circle or link,” they write. This simple exercise can give you an emotional boost.